Time: 9:36 AM-So I’ve been intentionally barefoot for all of 20 minutes and I’ve already noticed some things. First- pavement. Walking barefoot on that stuff hurts. Even though the grass is still wet and cold early in the morning, it is a welcome relief from the little pebbles and cement that clothe most of the downtown area. Second, the ground is a lot colder than the air. Even though it’s a mild 60 this morning, walking to meet my friend for breakfast reminded me that even just a simple pair of flip-flops or “chanclas” as they call it in Mexico would keep my feet warm. To be honest, I wasn’t going to do this today. I’m not home all day. I’m meeting my friend for breakfast, going to a coffee shop to do some work, and then going to class. Later I’m going to dinner with a friend and then a club meeting. But once I saw that Dan Morrison went to a diner in DC without shoes, I was inspired. So I’m hoping that as I recount my story throughout the day, you’ll be inspired not only to walk barefoot, but to use your resources on behalf of those who live in extreme poverty. Time 12:52 PM- So, after a delightful conversation with Katie from More Than Me, I took a walk from the coffee shop to the bus stop. I was going to walk all the way to class, but time wasn't my friend, so I hopped on the A route to the psychology building. This part of my day was interesting. First, I noticed how much more aware I am of where I am stepping. There is a lot of glass on Bloomington side walks! Second, I then thought about how much less aware of this situation I would be if my walk was immediately related to whether or not I would eat this week- how more focused I would be on my destination. I actually wondered what it would be like once I would become accustomed to this. Would I even be aware of the dirt digging into my feet? Another thing- no body notices. Ok, one person noticed on the bus, but she chose not to comment. I imagine that she thinks I'm just one of those "creative types". 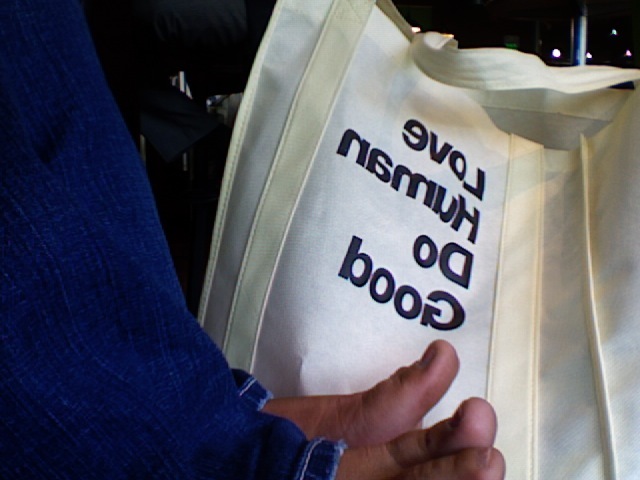 After all, I am carrying around my !deation Conference bag that says, "Love Human. 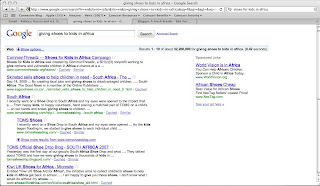 Do Good." A leading cause of disease in developing countries is soil-transmitted diseases, which can penetrate the skin through bare feet. Wearing shoes can help prevent these diseases, and the long-term physical and cognitive harm they cause. Wearing shoes also prevents feet from getting cuts and sores. Not only are these injuries painful, they also are dangerous when wounds become infected. Many times children can't attend school barefoot because shoes are a required part of their uniform. If they don't have shoes, they don't go to school. If they don't receive an education, they don't have the opportunity to realize their potential. In Ethiopia, approximately 1 million people suffer from Podoconiosis, a debilitating and disfiguring foot disease that is- get this- completely preventable. And of course, here's a shot from the classroom. I'll let you know if my professor says anything. Time 3:54PM: Ok, I'm a little ticked. I started this about 20 minutes ago and then Safari decided to act ridiculous. Alas. 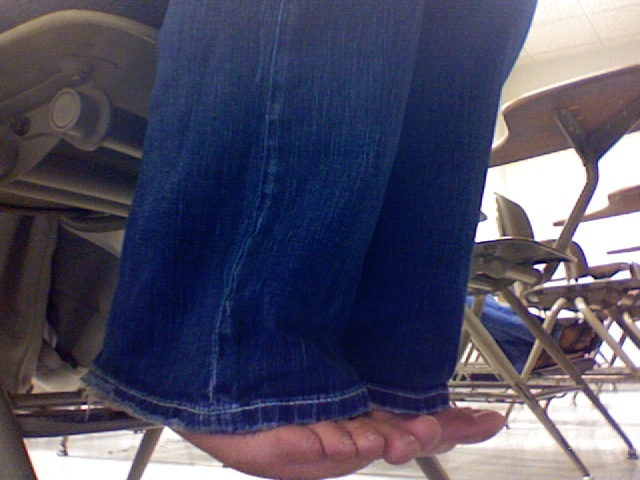 Here I am, over half way done with my day without shoes. I'm actually about to head over to Dunn Meadow here in a few minutes to get my feet painted...I'm still divided on whether or not I'm actually going to do this, but I'll at least get to see who else is joining me today in the Bloomington area! They're doing this walk around campus, so it should be fun. 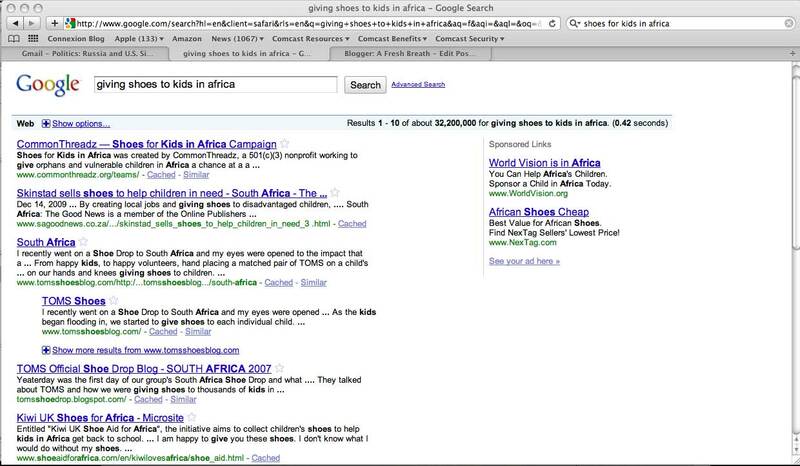 So, Audrey, you asked for some organizations that give shoes to kids in Africa. I'll name two because the others I found were either collection sites or their sites broke my internet. The first one is the group putting this on-TOMS (see the link above). The concept is that you buy a pair of shoes and they give a pair. They're a sustainable way to get kids going to school with shoes on their feet. It's awesome. The second group is Common Threadz. You can actually TEXT a pair of shoes to a kid. Creative! Time 1:48 AM: So the day is over. I can wear shoes again. And I want to tell you about the event I attended. About 50 or so of us gathered at Sample Gates on campus and did a lap around the entire university. The walk took about an hour and I kept fairly quiet as I observed. Many, if not all, of the students were younger than me, which of course made me laugh. As we were walking together, I noticed the laughter of two girls next to me. This made me think about the kids I know in Mexico. How, even though they have little, they are still able to laugh, giggle, play, shout, and enjoy life. It's kind of amazing how something as significant as footwear can be...well...insignificant. As we continued on, I began asking the students why they were involved. Some joined because they just love TOMS shoes, others joined because friends asked (or mandated) that they attend, and still others just wanted an excuse (and a good one) to walk barefoot. I took the opportunity to explain a little bit about what I had discovered today about Podoconoisis. Most of them ended up asking if I had organized the walk- I mean, since I knew so much about it. I chuckled and told them that I had researched it that day. And once I told them that I was graduating in May from graduate school, they all resounded an understanding "Ooooooh" as if that explained my "unique" understanding of the issue. And of course, this all led me to contemplate our work a bit. I mean, it's great to get people involved, asking questions, being "activists" for our cause. It's exciting and builds community. But I would say we have a fierce responsibility to educate. Because although it may be laughable that Brian did this walk because Kim asked him to, if he knows the impact of what he is supporting, Brian can become a powerful voice and advocate-and even fundraiser. I'll end with some pictures from the walk. Thanks for joining me! Amy, this is incredible! What an awesome journey.. I cant wait to read your end of the day thoughts on this... what kind of programs are out there to bring shoes to people who have none? Hey Amy! I'm in there with you. I'm about to head to my blog and write about my experience. I am not home all day today either, plus I had things to do here that were, ummmm, interesting in bare feet. I have a chorus rehearsal later today, and we'll have to see how that goes. If you're interested in checking my blog out, it's joyfulferrets.wordpress.com or it's linked in from my facebook profile. :) Happy barefootin'! WOW!!! I never knew those facts about soil- transmitted diseases and that shoelessness can prevent children from receiving an education. Awesome way to spread awareness. Do you know-- was this the first annual day without shoes?